"No matter how far down the drug or alcohol rat hole you go, there is hope, a way out and the possibility of creating a life of your dreams: spiritually, physically, emotionally, mentally, and financially." This compelling new autobiography, 180 Degrees, demonstrates just how sincere these words can be. An inspiring true-story of a once homeless, teenage drug addict who was able to achieve sobriety and ultimately become a self-made millionaire by the age of 30." Robert shares his extraordinary journey from one extreme of the human condition to the other, literally changing his life 180 degrees. His journey is a powerful rags to riches' story of despair, hope and triumph. 180 Degrees begins with an engrossing depiction of life as a teenage drug addict. As Robert's dependency becomes ever more apparent, the trials, tribulations and consequences of addiction consume and begin to bury him. His excessive consumption takes control and his life spirals downward, giving the reader a view into the insidiousness of drug addiction and the sleazy, unscrupulous lifestyle that accompanies it. Rob leads his audience through the despondency afflicting him before reaching that pivotal moment of when he decides to change his life. No longer capable of controlling or debating his drug addiction, Robert slowly reclaims his life by getting honest, willing and eventually completely sober. 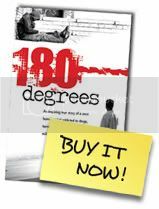 With determination, inexhaustible effort, and applying the invaluable lessons learned from twelve-step programs, 180 Degrees shows how anyone can achieve a life of serenity and prosperity. Culminating in a step-by-step process, readers gain insight and valuable tools which they can employ for their own success. This book is an invaluable resource for anyone who has given up hope for themselves, or for a loved one who is self-destructing through substance abuse.